Sample job application for data entry operator in companies, offices and organizations. This job application can be used for any data entry position after customization with your personal details like education, experience and other information. With due respect I wanted to tell you that I have come to know that you are hiring data entry operators. Sir I have done computer course and I have 2 years of experience in the relevant field. I shall be really thankful to you if you will consider my request and give me a chance to serve your company. I have attached all the required documents along with this application. Thanks. 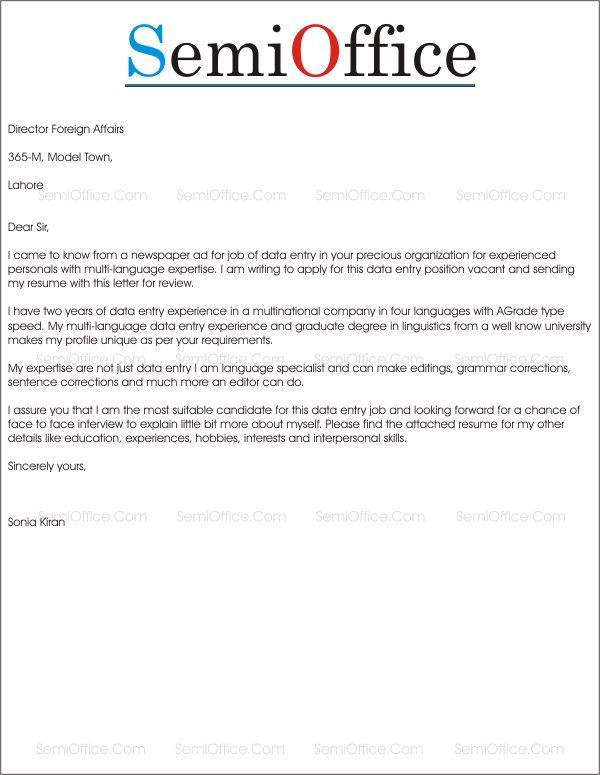 I came to know from a newspaper ad for job of data entry in your precious organization for experienced personals with multi-language expertise. After reading the detailed job description I am writing to apply for this data entry position vacant and sending my resume with this letter for review. I have two years of data entry experience in a multinational company in four languages with A-Grade type speed. My multi-language data entry experience and graduate degree in linguistics from a well know university makes my profile unique as per your requirements. My expertise are not just in data entry I am language specialist and can make editing, grammar corrections, sentence corrections and much more an editor can do. I assure you that I am the most suitable candidate for this data entry job and looking forward for a chance of face to face interview to explain little bit more about myself and skills. Please find the attached resume for my other details like education, experiences, hobbies, interests and interpersonal skills. With reference to the post of your official facebook page for the post of data entry operator I am sending my resume to consider for this data entry job. I have one year work experience of data entry operator as per your requirements. Please check the attached resume for details about myself. Thanking you. Hope you are doing well. With reference to your Data Entry Job Ad at Odesk please review my profile page at Odesk ……………. to consider me for this job. In short I am experienced and competent Data Entry Expert in many languages including British and American English languages with a high profile rating/rank at Odesk. My per hour working rate is already competitive and can be negotiated if your are interested after reviewing my profile ratings. Looking for your feedback and response to my email.